Last week I gave a talk and taught a 2 Day self-portrait workshop in Cork for Cork Textiles network. 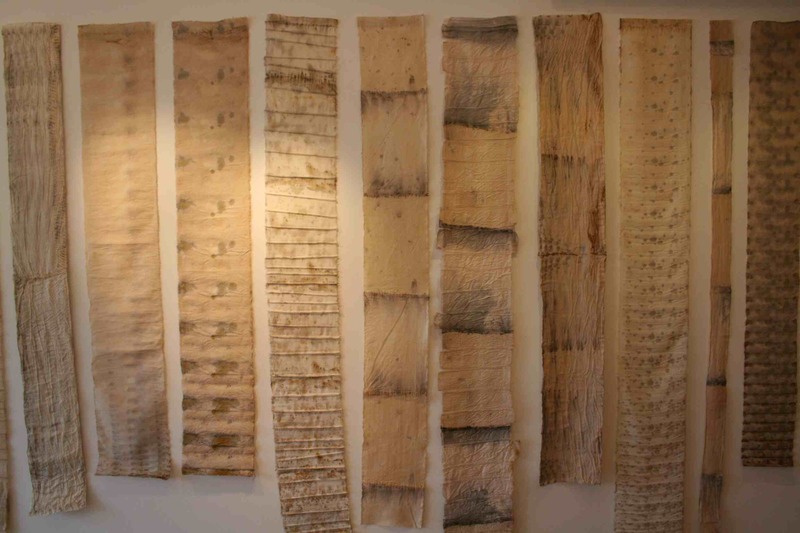 They are a talented and diverse group spanning many different textile disciplines. Here you can see a selection of the work produced at the workshop. 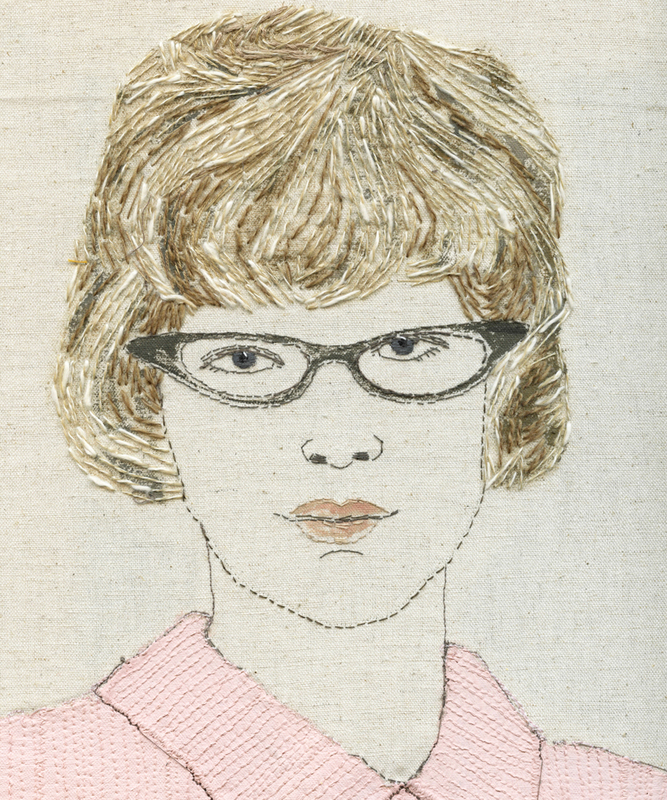 The finished portraits will be shown at the Knitting & Stitching shows next year (2018) on the Cork Textiles Network stand and I’m itching to see the final results. All portraits will be A3 in size. 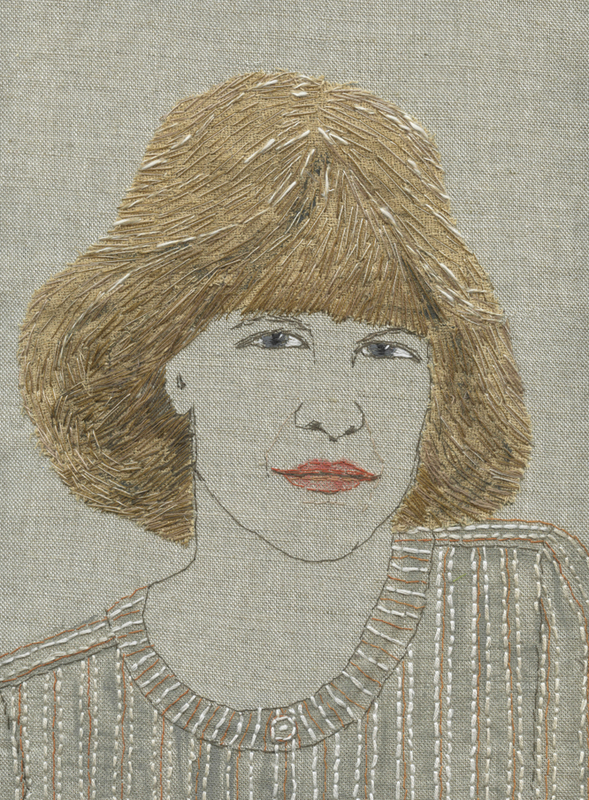 This entry was posted in Art, drawing, Embroidery, Portrait Workshops, Sewing and Stitching, stitch, Talks, Textile Art, workshops and tagged cork textiles network, embroidery, hand stitch, portrait, self portrait, stitch, sue stone, textile art, workshop on October 21, 2017 by womanwithafish. 63 is a self-portrait which, when complete, will be made up of 63 images, one for each year of my life so far. So why put myself through all this work, and, to be perfectly honest, the angst of self examination, a replaying of all the ups and downs of life? Well, there were several reasons, but the main one was that I was asked by Alf Ludlam, the curator of Shifting Images an exhibition of self-portraits at the Muriel Barker Gallery at Grimsby’s Fishing Heritage Centre, to produce something other than a straight forward self-portrait and this was the idea I came up with. I also thought it would benefit me personally because I would be working to a deadline which, in itself, would force me to look at the way I work and help me find a simplification of my mark-making. Although I work in mixed media I consider myself primarily an embroiderer, more specifically a hand embroiderer and because I find hand stitching a therapeutic process, I have a tendency to overstitch. I’m hoping that, in this piece, the viewer will find that my stitching have been given more breathing space and as a result more status. My stitch vocabulary is considered and limited. I don’t use many different types of stitches and but I try to get the most out of those stitches by using them in an original way. I was once given some advice by Constance Howard, when I was studying at Goldsmith’s College in London who said that “you don’t need to know a vast array of stitches but you need to know how use the ones you do know well” so that’s what I try to do. 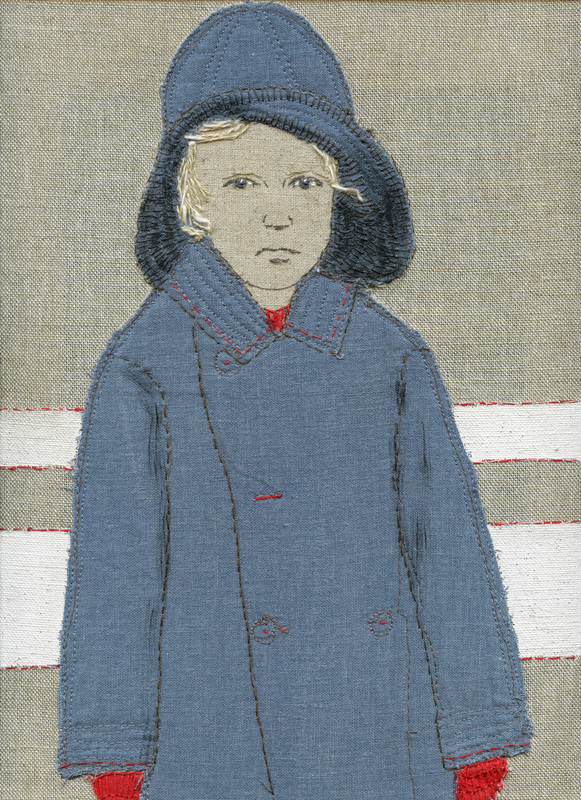 I don’t really look at the work of other embroiderers in an inquisitorial way. This is deliberate, an attempt to keep my own work fresh. One of the ways I do this is by mixing different colours and different weights of threads in the needle leaving the eye to mix the colour. 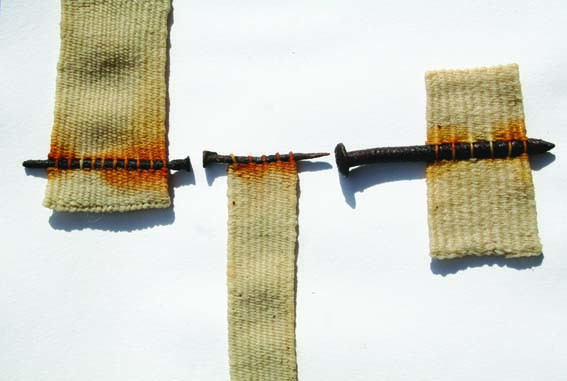 You can read about my favourite stitches here. 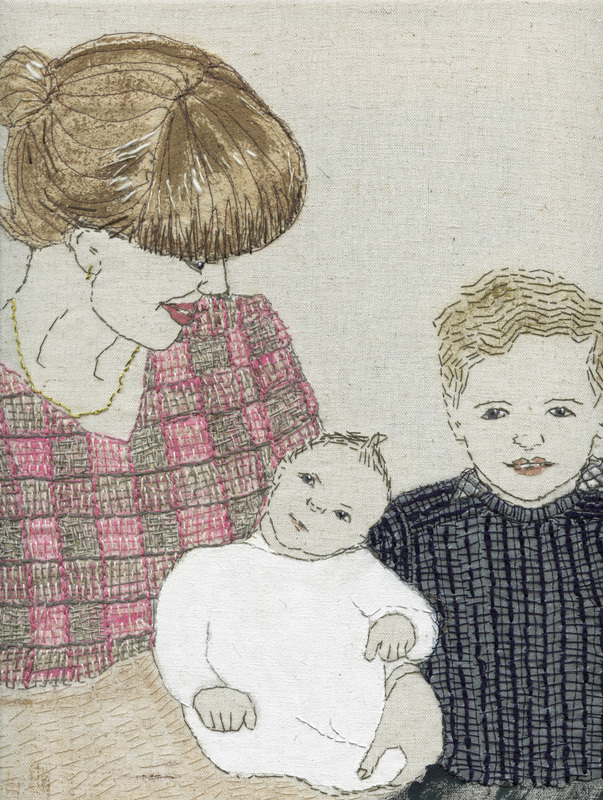 I have deliberately tried to be sparing with my stitching of the faces in this piece to produce a more illustrative style. Mood, quality, expression, character can all be changed by the position of each stitch and a lot of drawing and re-drawing, stitching, unpicking and restitching has been done before moving on. I am a ‘glass half full’ sort of person but the process of making this piece has, so far, and I am only just over half way there, been an convergence of mixed emotion. The process has, at times, evoked difficult and even desperately unhappy emotions, the reliving of all that teenage angst, hurt, heartbreak, and loss, the business problems and burglaries, but alongside that the uplifting and happy memories of friends and family and an optimism for the future. Overall it is proving to be a quite cathartic process. Working in partnership with Abbey Walk Gallery the Muriel Barker Gallery at the Grimsby Fishing Heritage Centre will host an Exhibition of of self – portraiture by Lincolnshire Artists past and present. 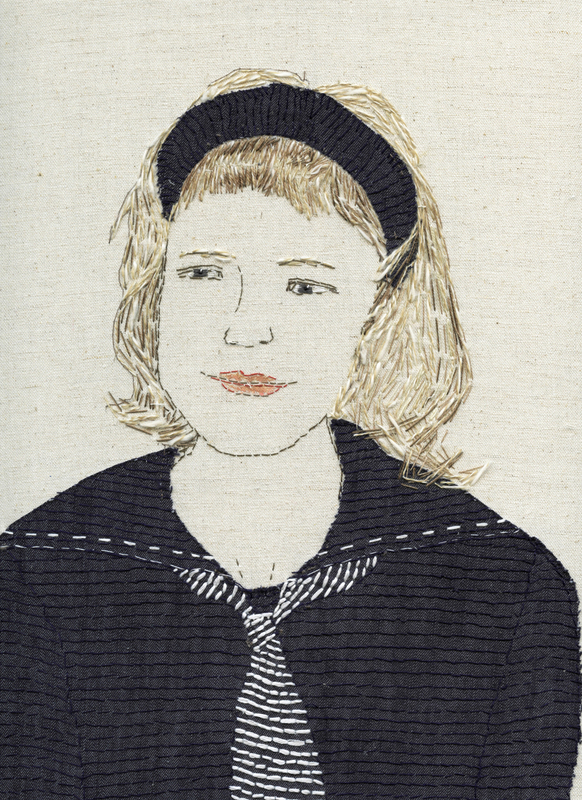 This entry was posted in Art, Art Galleries, drawing, Embroidery, exhibitions, Grimsby, Muriel Barker Gallery, Sewing and Stitching and tagged arts, embroiderer, embroidery, mixed media, portrait, self portrait, sue stone, textile art, textile artist on August 4, 2015 by womanwithafish. The opening of the 62 Group Ebb & Flow exhibition is getting closer but the project itself has been almost two years in the planning. It started with an invitation from Grimsby Minster to show our work in the Minster which is a busy and vibrant resource for the people of North East Lincolnshire, an “architectural gem” tracing its history on this site for more than 900 years. I soon realised, however, that because we are such a large group of very diverse artists that there would not be enough suitable hanging space and display for smaller 3D work in the Minster for all of our work to be shown. A second venue was sort and we were offered the upper floor, the mezzanine, of the Muriel Barker Gallery at the Fishing Heritage Centre in Grimsby. The Grimsby Fishing Heritage Centre was purpose built and opened in 1991. Its permanent exhibition tells the story of the Grimsby Fishing Industry in its heyday in the1950s. The white-walled space at the Fishing Heritage Centre contrasts nicely with the grandeur of the Minster. The Ross Tiger, GY398, is an ex-working 1950’s trawler and the largest item in the heritage collections. 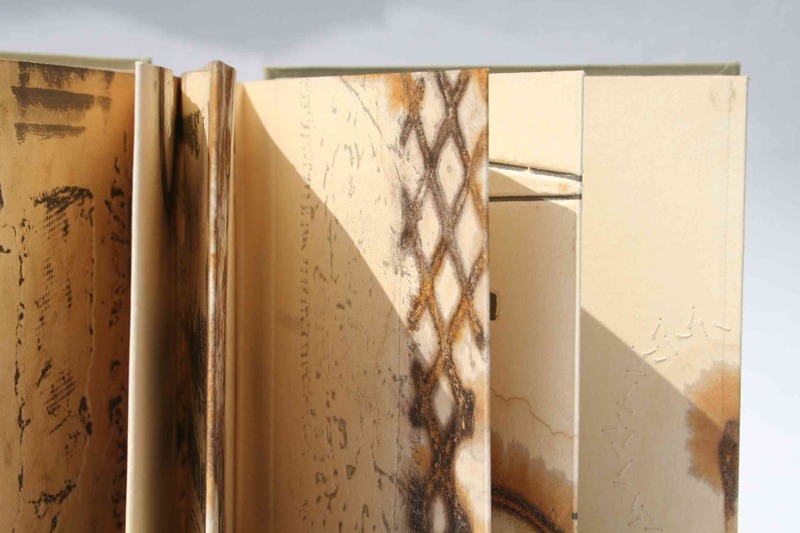 Lucy Brown, one of our exhibiting members has made site specific work to be shown on board the Tiger. The image left shows Lucy’s ‘sea bags’ which will be installed around the living quarters on the Tiger. Once the venues were in place we worked on the detail of the project and funding bid to Arts Council England by Grimsby Minster which was successful. This enabled us to work with freelance writer and curator, June Hill who has been on hand to advise the group throughout the project and who will be opening the exhibition on 13th September. It also helped the group to put together a full education programme and to produce a full colour catalogue with professional photography which will be on sale at both venues. Details of our education programme can be found here. Many of our members visited Grimsby in February when we were given a tour of both venues and of the museum collections store. All of our exhibitions are selected by a selection panel of 5. The panel is different for each exhibition and can include a representative from the venue. The selection process has now been completed and 37 pieces of work were selected for the exhibition made by 28 artists. This week we also completed the photography for the catalogue which is now in the design stages. The catalogue will be on sale at both venues. The photographer for the majority of the pieces is David Ramkalawon who came to Grimsby from London for 2 days to photograph work at both venues. The snap left shows David photographing work in Grimsby Minster. Next week the hanging process begins. Watch this space for more ‘behind the scenes’ glimpses of Ebb & Flow. 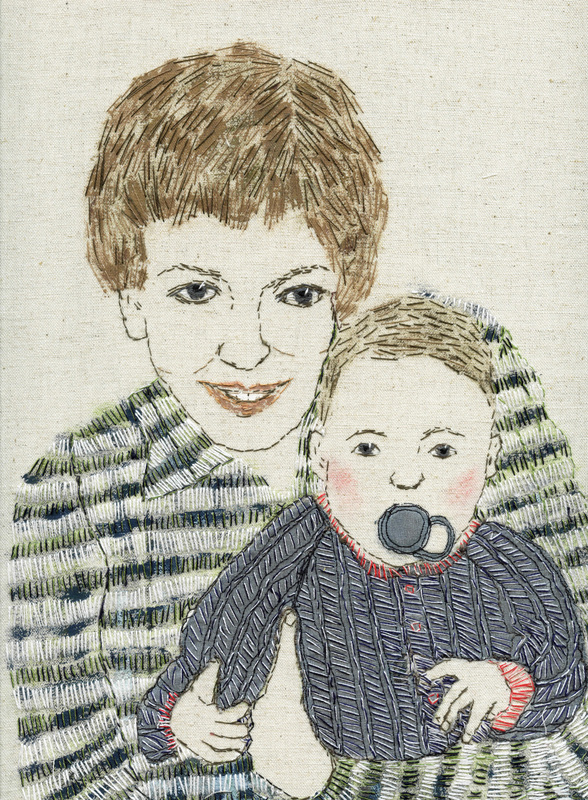 This entry was posted in 62 group of textile artists, Art, Art Galleries, drawing, Education, Embroidery, exhibitions, Grimsby, Grimsby Minster, Muriel Barker Gallery, sculpture, Sewing and Stitching, Textile Art and tagged 62 group of textile artists, 62group, arts, embroidery, exhibitions, Grimsby, grimsby minster, hand embroidery, June Hill, london, Machine stitch, mixed media, paint, stitch, sue stone, textile artist, textiles on August 24, 2014 by womanwithafish. Earlier this week I had the privilege of helping to hang Alice Fox’s solo exhibition ‘Tide Marks’ at Gate Gallery, Grimsby. This exciting exhibition runs from 24 October to 30 November 2013. If you can’t wait for my full review of the exhibition for the Textileartist website, you can find more information about the show here. Here are a few images from the show to wet your appetite. All images courtesy of Alice Fox. This entry was posted in Art Galleries, drawing, Embroidery, exhibitions, Grimsby, Textile Art, textileartist.org and tagged Alice Fox, collograph, embroidery, exhibitions, gate gallery, Grimsby, hand embroidery, mixed media, print, sue stone, textile artist, textiles, Tide Marks on October 25, 2013 by womanwithafish. 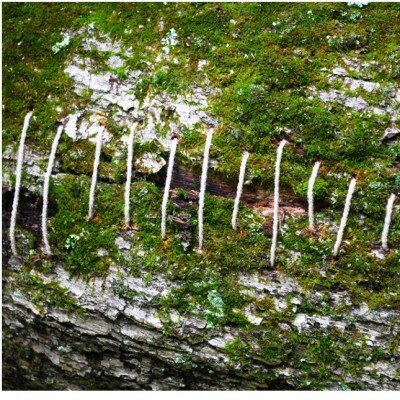 If you go down to the Pink Wood near Bruton in Somerset during Somersets Arts Weeks you will discover the 62 Group of Textile Artists taking up the challenge of working in this beautiful woodland environment. The 62 Group is an international group of textile artists, with members in Japan, Germany, Sweden, Australia as well as this country. The group usually exhibit in galleries but this year they have been invited to create innovative installations out of doors. This challenge was set by a former member, Hannah Streefkerk, a Land Artist working in Sweden and Norway. 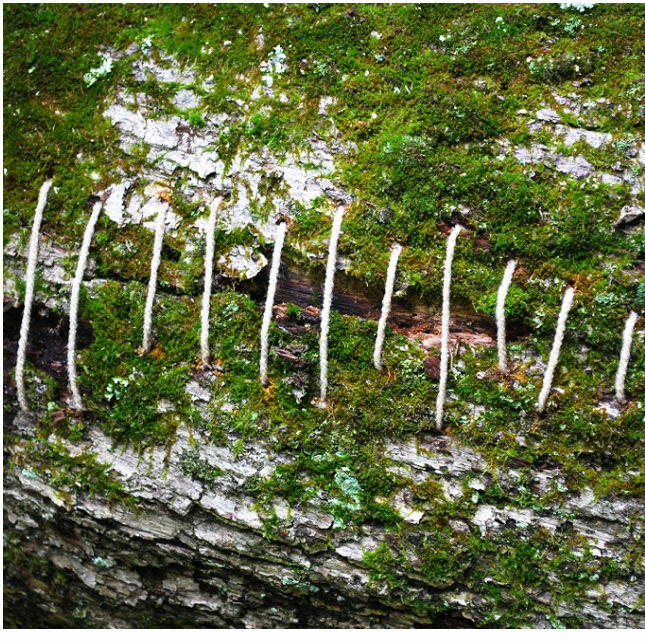 Her work often involves ‘mending’ the environment by stitching across voids or cracks in trees. 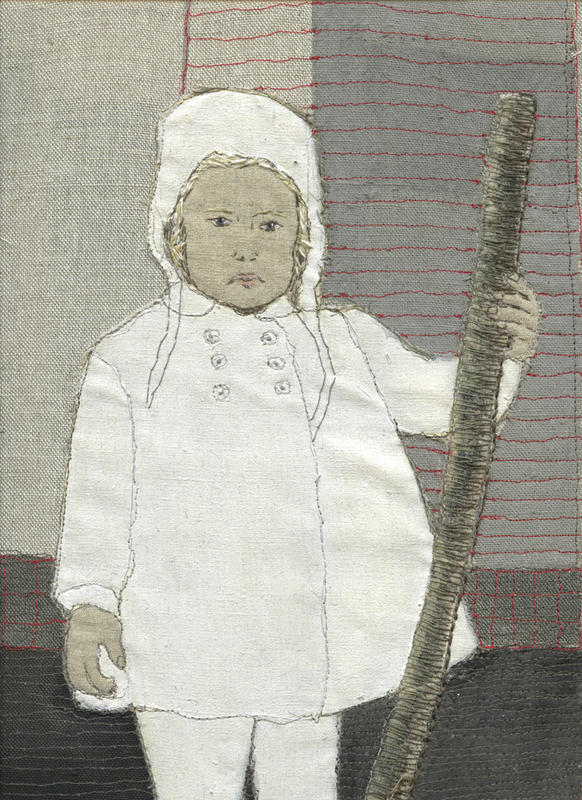 Image by Hannah Steefkerk of work called ‘Restoration’. This entry was posted in drawing, Embroidery, Recycled, Textile Art and tagged 62 group of textile artists, 62group, bruton, exhibitions, jae maries, jan miller, penny burnfield, pink wood, sian martin, somerset arts weeks, textiles on September 8, 2013 by womanwithafish.